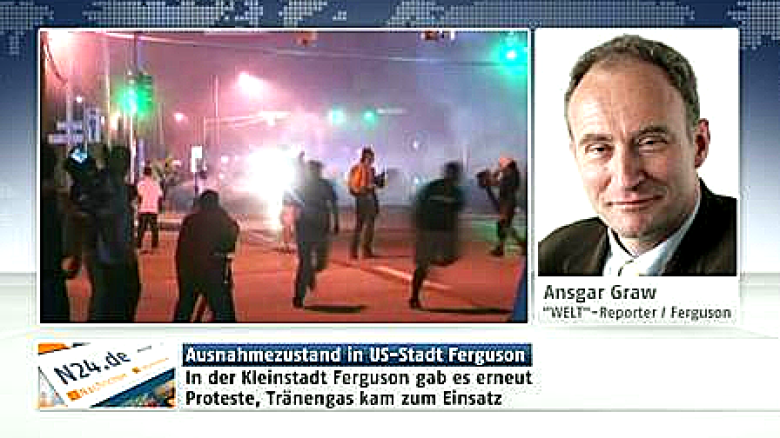 “Die Welt” correspondent Ansgar Graw went to Ferguson, Missouri, to report on the unrest following the death of a black teenager. He ended up arrested by police. Here is his account of events from a city in chaos. The police, your enemy! That is what Will tells me on Monday evening in Ferguson, the city in Missouri where on August 9 a white cop shot and killed an unarmed 18-year-old black man, and over the following night more shots were fired and the police used tear gas. Martial law? Why should the police want that? Will, an African-American with a muscular shirtless figure and long dreadlocks, hesitates only briefly. Then he changes the topic: Malcolm X was shot, Martin Luther King was shot, and also Abraham Lincoln, who was not black, but stood up for the abolition of slavery. Will, who doesn’t want to say his last name, looks about the same age as Michael Brown. An age when it’s easy to believe nonsense. The day before I had met a completely different kind of police. On Sunday, my flight landed two and a half hours late in St. Louis and I first arrived in Ferguson well after midnight. During the evening police had already closed off West Florissant Avenue, the main street in the suburb of St. Louis where there were riots, arson and looting after Brown’s death. Police cars blocked the access roads and made it unmistakably clear that there was no way through. So I have to look for another way : a little further, then left, through narrow streets, along small houses, to get closer to the scene. It works: at some point there is only one police car. That could hardly be overlooked. The road is littered with cobblestones, plastic bottles and broken glass. In some places stones are heaped up into actual ammunition stockpiles on the sidewalk. Among the demonstrators there were obviously quite a few who were out on the rampage. We chat a bit more about German and American beer and football, then the on-site inspection is finished, the journalist beats a retreat. “Just stay on the wide, lit street. Here it’s really dangerous, buddy!” Thanks, will do. Monday finally arrives. In the late morning West Florissant Ave already offers a completely different picture. With impressive accuracy and speed, the mainly black residents clear the streets of stone rubble and assorted thrown objects. The stories they tell about the previous night paint a completely different picture from the accounts given by the police: the residents say they were demonstrating peacefully, when at 8.30 — long before the midnight curfew — the police, without any warning, started using tear gas and smoke bombs to disperse the crowd. Because the roads were already blocked off, however, people were unable to get away. That obviously increased the anger. Yes, demonstrators may have also thrown rounds of tear gas back at the police, and they did throw stones too. But shooting? According to the angry protesters, it was the police firing into the air, to have a reason for intervention. The police, your non-friend. It gets worse. A little later, together with a colleague, Frank Herrmann, who has been reporting for years from the US for various German regional newspapers, we want to go back to the burnt down gas station. It’s Monday, around 2pm. At this time this section of the road is almost deserted, no signs of violence or rioting. Nevertheless, the police want to scare us away: “Journalists should gather at the eastern end of Florissant Ave, by the large shopping mall. For your own security.” But we don’t feel threatened in any way here: everything is completely peaceful, and we explain that we want to stay on this part of te road and take some photos. “Okay, but only if you keep moving. If you stand still once, you will be arrested — this is the last warning!” A young officer expressively brandishes his bundle with the flexible plastic handcuffs. Taking photos is difficult if you have to keep moving. So I just walk in small circles, from right to left and left to right, without ever standing still, while keeping an eye on the gas station. The police, turning into your enemy. “That’s enough,” says the County officer who is obviously in charge, and has us handcuffed. We ask for his name. “My name is Donald Duck,” he says. Ten minutes later, when we have to climb in an urgently dispatched prisoner transport van – which, despite orders to do it “quickly, quickly”, is not an easy task with our hands tied behind our back and cameras dangling from our shoulders – Mr. Duck (the Arrest Report later names one “Officer Amero”) scolds us once more, telling us we are behaving like teenagers. Just because I said he sounded familiar? The plastic handcuffs are once again drawn tighter, presumably so that we don’t forget about them too soon. The van takes us to the nearby makeshift operations center. There we have to empty our pockets: purses, watches, cell phones, recorders, tissues are collected. At least another officer, who seems to find the whole action a little embarrassing, cuts off the plastic restraints and replaces them with classic metal handcuffs. He ignores our request for a sip of water: we are told that later, in jail, we will be given something to drink. Another van brings us to the Justice Center, the prison of St. Louis. During this trip we get separated. I am squeezed in a small cell just behind the driver’s cabin. It stinks of urine. My colleague Frank Herrmann must sit in the rear, where there is room for six to eight prisoners. At the moment, however, only two other men are sitting there, one hardly over 18, the other in his 30s. They introduce themselves as proud members of the US Communist Party. All of us, two journalists and two communists, are put in prison in a common holding cell. Time to talk about the prospects of world revolution. Oh well. The young man carries a bottle of milk. You need to rub milk in your face and skin, he says, assuming the pose of scarred war veterans, when the police shoot tear gas. Then we have to come out one by one. For the second time, our pockets (which are already empty) are searched. We also have to hand over belts, shoelaces and a wedding ring. Frank Herrmann can credibly demonstrate his inability to get the wedding ring off his finger. And despite the threat of ending up in a cell with no television, he gets to keep the gold piece. There follows a measurement of blood pressure and an interview by a doctor: “Do you suffer from allergies? Are there any specific foods that you cannot eat? Have you ever had suicidal thoughts?” No, no, no. We re-emerge, to another desk. Stay where you are! Stay! Where! You are! Hands on the counter. On! The! Counter! Our pockets are searched for a third time. Finally we are now freed from the handcuffs. And again we are taken into a holding cell. Then comes the famous mugshot moment. Welcome to the rogues gallery. The photos will likely appear very soon on the Internet. For me this is an entirely new experience. I have been in several conflict zones: I was in civil war regions in Georgia, in Gaza, I illegally entered the Kaliningrad region when the then Soviet Union strictly prohibited access to westerners; I was in Afghanistan, in Iraq, in Vietnam and in China; I secretly met dissidents in Cuba. But to end up arrested and roughly treated and snarled at by police and see the actual inside of a prison – for that I had to travel to Ferguson and St. Louis in Missouri in the United States of America. It has now been three hours since the arrest. We asked for a drink of water several times in vain, and our request to be allowed phone calls was also dismissed with a “later”. Good thing none of us had an urgent need. But then everything moves quite quickly. We get back our belongings and are allowed to go. Incidentally, the two fighters for world revolution are also released shortly after us. Whether a court date will follow, we don’t know yet. The numbness in the wrists is gone, and this absurd interlude will certainly trigger no nightmares for me. No one shot at us, no one really brutalized us. But my childlike trust in the police, my belief that – even in the USA, which I have always so passionately defended from their many critics – the police, despite their often harsh and unsympathetic manners, is your friend and helper – that belief is gone. Journalists arrests and riots in Ferguson – The violence in Ferguson (U.S. state of Missouri) after the shooting of Michael Brown by a policeman continues. 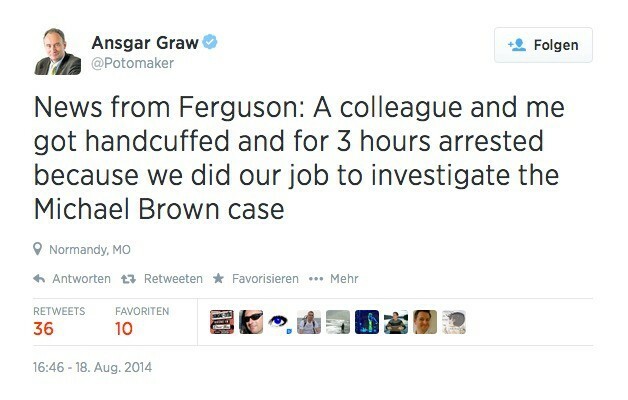 The police arrested several journalists reporting on site — among them “Welt” correspondent Ansgar Graw. He posted this tweet.